Waffle and Dr. Warlord (their camp names) returned home from camp today. Those were the names they chose for themselves and used all week. Both boys had huge smiles on their faces. Both boys gave the camp 10 out of 10 stars. Waffle’s only gripe was that the first night Warlord got homesick and ended up sleeping in the teen cabin with him. Eventually Warlord started sleeping in his own cabin on the third night. Waffle claimed annoyance. Dr. Warlord said it was all about love. They told us that there was one part of the camp where they talked about hopes and wishes and everyone cried, including them, but they said it was a good cry. For two boys who were extremely reluctant to attend this camp, they felt pretty happy about the whole experience. We picked up Waffle’s, class schedule this week since he was away at camp. What a social gathering! It was nice to see everyone and weird to be there without children. My boys are already back to their computer games but I think after that we shall play a game or two and maybe I can sneak in a snuggle. It’s good to have them home. Tags: Black eye, Camp Kessem, Good Bad Samaritans, school beginning | Permalink. This is the week the boys went to Camp Kesem. This is a magical place for children who have had a parent with cancer. It’s a place for them to just be kids and enjoy themselves. We met the counselors in May at their informational meeting and the boys were excited to go. But the night before, they both were a bit unhappy about being gone for five nights. We assured them that it would be a good experience for them and a chance to bond with other kids going through the not so fun experience of having a parent with cancer. We dropped them off on Sunday and will pick them up on Friday. This is the inaugural year for the Santa Clara University Chapter so they kept the camp small at less than thirty campers. There are 16 staff members so the ratios are excellent. I have seen a few pictures and it looks like the kids are having a good time. My younger son, I think I will call him Ferdinand, was a little homesick the first night. The counselors checked in with us and we helped them with ideas for easing his homesick feelings. So far, they seem to be working. There are many branches of Camp Kesem throughout the country and it is a completely free camp. If you know of children who have a parent who has been through, is currently going through or has passed away from cancer, please send them a link to Camp Kesem. It’s been really quiet in our house. Too quiet. I miss those boys. But I know they are having a good time and that this is a great experience for them. My first thought when I was diagnosed was for my boys. I was so concerned for them. I actually felt like I had failed them as a parent by being diagnosed with breast cancer. I was so down on myself about what my illness would do to my boys. And we had a rough time. We bonded as a family but it was all still very rough. The hardest thing for me is not being able to be the active and energetic mom that I used to be. I know we all do the best we can but my best is not great at the moment and not at all what I envisioned for them. And one thing I have learned is that having a parent with a serious illness can make you grow up really fast. And that is why I am so thankful that an organization like Camp Kesem exists. I hope my boys have taken full advantage of the opportunity to just be kids and enjoy themselves. Because this stuff is really hard when you are a little kid. And everyone has commented on how supportive my boys are and how well they have handled my illness, but that in and of itself is a concern when you think about it. I mean, it’s great that they have been so awesome but it is hard to see them acting so grown up. It’s not normal to have to grow up so fast. But it is a reality for so many kids today. I just know that this cancer stuff was never in my game plan. When they were babies, I never once even entertained the thought that something could happen to me. I was just trying to keep the two of them alive, you know?! I miss those two so much and I don’t like the quiet that has fallen over the house. I can’t wait for them to come home to us. But I hope they are having the time of their lives. Tags: Breast cancer, Camp Kesem, parenting with cancer, summer camp | Permalink. I am back to feeling pretty crummy most of the time. I had stopped Tamoxifen before my last surgery and felt better almost immediately. I started it back again at the end of May. And now it is August and I have taken that white pill every night for two and a half months and I am back to feeling awful. The first week I was ok. Then things started to hurt. Then I started gradually to wheeze again. And then there was a bit of malaise which turned into fatigue which turned into exhaustion. I feel not great all the time. I feel like you feel when you are about to get the flu. Kind of achey and run down. Only the flu never comes and I just keep feeling lousy. I am also wheezing again. I have difficulty doing anything remotely strenuous. It’s a challenge to just get off the couch without being short of breath. I am also quite un-Tiggery most days. I’m just back to being an Eeyore. And I am supposed to do this for ten years. I don’t think I’m going to be able to do that. And I know there are people who will say that having a recurrence is much worse than Tamoxifen side effects and I agree. To a point. There are plenty of people who take Tamoxifen for the prescribed years who still end up with a recurrence. It’s not like Tamoxifen is the magic answer. All Tamoxifen does is lower my chances from like a 20% chance of a recurrence to a 15% chance. It doesn’t work for a lot of people. So I’m taking this drug that increases my chances of endometrial and ovarian cancer, it increases my risk of blood clots and it makes me feel like a mildly stinky pile of poo most of the time just to cut down my very likely chance of recurrence by a mere 5-8% points. What would you do? Would you spend whatever time you have left taking a drug that *might* prolong your life and/or might give you cancer in other places and at the same time has some really gnarly side effects like the ones mentioned above? Or would you rather spend your respite feeling good? Feeling human. Because guess what they give you if your breast cancer recurs? Anti-hormonals like…you guessed it Tamoxifen. Right now. I have no energy. I have shortness of breath and I ache everywhere. I don’t feel like I am really living any kind of life. And I keep going back to the fact that all that time when I had cancer and didn’t know it? I was running marathons and half marathons, I was working a job that required a lot of energy and I was actively raising my boys. I felt great. I felt great while I had cancer. And now I am doomed to ten years of feeling like I have the flu? What’s the freaking point? If they were able to say to me, “If you take this drug for the prescribed time, your cancer will not come back. 100%” I would be more apt to keep taking it. But nobody can tell me that. Nobody. It’s all, well MAYBE it will work…it works for some people. And I keep taking it because I am scared. Because I am hoping that it will do it’s job and keep the cancer away. But what is the point of being here if I am just a lump on the couch? I am tired of feeling badly. I am tired of this. I did what I was told. Surgery, chemo, radiation and anti-hormonals. I have not felt good in a year and a half. I am tired of being a patient. I am tired of feeling horrible. I would like to be able to breathe again. But I don’t want to die. And I really don’t want to die the horrible death that is death by breast cancer. Although, I probably will anyway regardless of what I do. And I can talk myself into circles of this for days. And I keep taking the meds. Even though they make me feel absolutely miserable. Tags: Breast cancer, Quality of life, Side effects, Tamoxifen | Permalink. I am not the world’s greatest gardener. My thumb is brown. Two summers ago, I gave up and planted nothing. 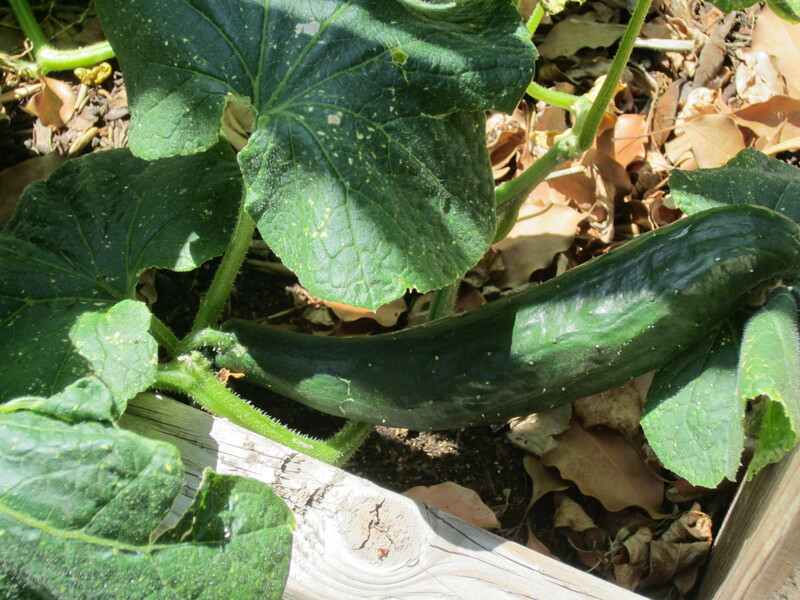 Last summer, my younger son planted the garden with his grandma and it flourished all summer. They planted tomatoes. Just tomatoes. And it was glorious. My son got kind of tired of it though. There were just so many tomatoes to pick. “I swear Mom, I am going to rip those plants out by the roots!” he said by the time September came and there were still tomatoes to pick. This year, we planted again. 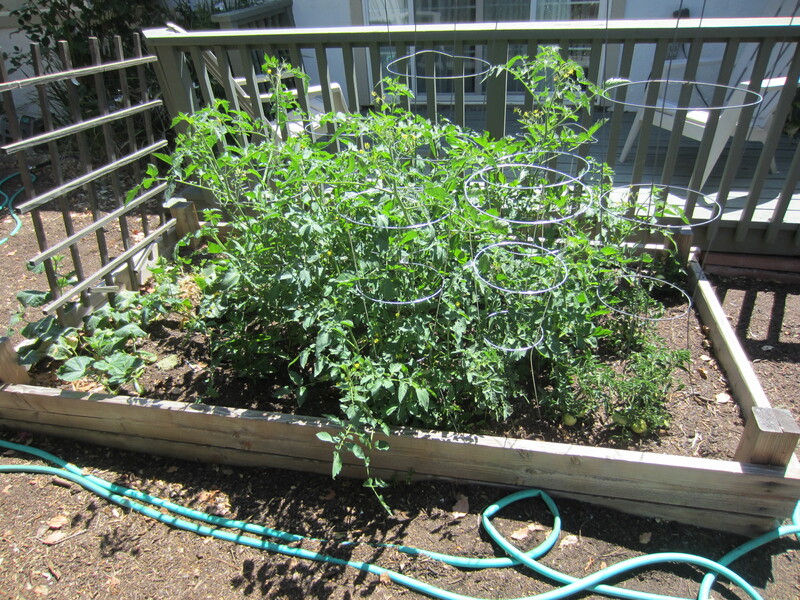 Tomatoes, jalapeno, cucumbers, lettuce, sweet peas. And then the cucumbers fizzled. I go four of them which is four more than I’ve ever gotten so I am still marking it as a success. The lettuce was ok. Younger son would just go out and eat it straight from the garden so it didn’t last long. The sweetpeas I planted never grew. We got a lot of tomatoes again. But not as many as last year. Oh well. 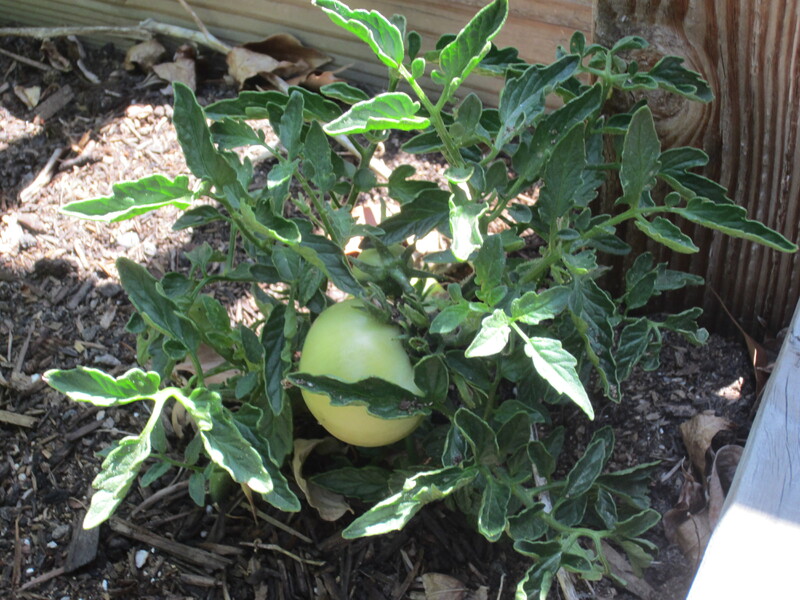 The jalapeno grew but never produced any peppers. What’s the deal with that? I fertilized and watered and composted and nothing. It’s frustrating. But we have lots of tomatoes. Younger son (I need to come up with a name for him on this blog) has discovered the culinary ambrosia that is clam chowder. I decided to make him some in my crockpot as a special treat. But here’s the thing, 3 out of 4 of us in this house are avoiding dairy. My husband has developed a definite allergy, my older son and I have a definite intolerance. 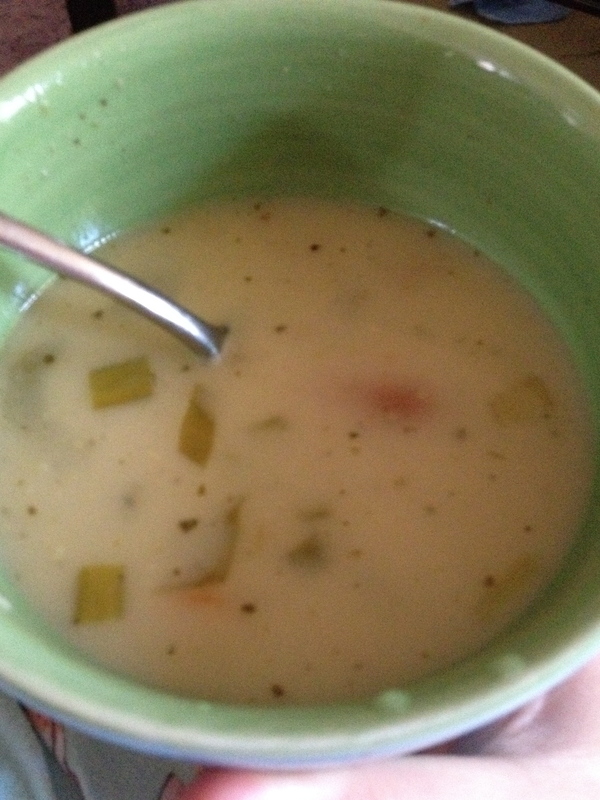 Dairy free clam chowder? Will that even work? Well, yes, mostly. I started with some frozen chicken broth I made about a month ago. 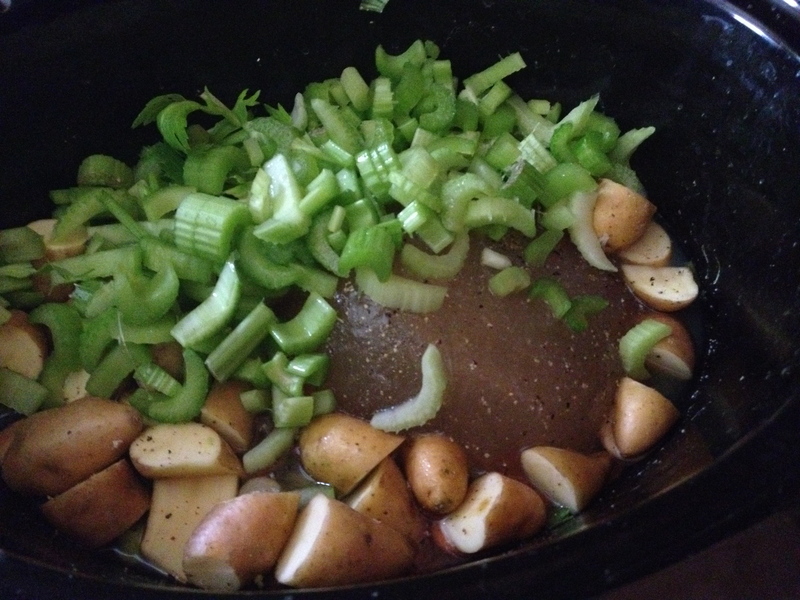 then I added celery, green onion and potatoes that arrived in our CSA box. Then I decided to go really crazy and added some tomatoes from the garden. I used two cans of whole clams from Trader Joes and let that all steep for a couple hours. 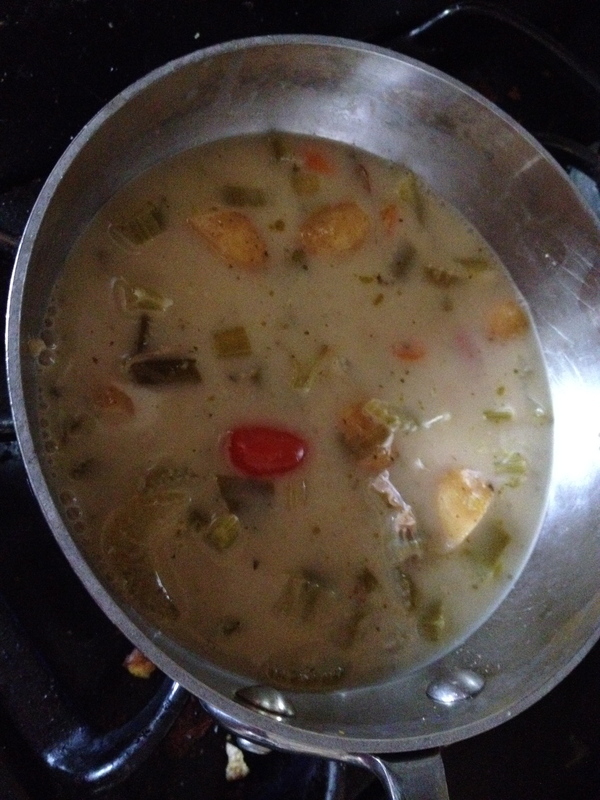 Then i added a can of coconut milk ad while digging through my pantry, I found a jar of Trader Joe’s green curry simmer sauce so I threw that in too and let it cook in the crock pot a few more hours. I ended up not eating it the day I made it and reheated it the next night for dinner. It turned out pretty nicely. My older son said it was sweet and spicy. My younger son was disappointed because it was not a traditional chowder. But they liked it. My husband wouldn’t eat it because apparently, he doesn’t like clams. Married for 14 years, never knew that. It’s difficult when you have spent a lifetime consuming dairy, to suddenly be without. Goat cheese (we only avoid cow milk) pizza is not the same as good old mozzarella. We’ve tried cheeseless pizza but it can be a bit depressing. Plus pizza with no cheese is messy. The toppings won’t stay put without the cheese to glue them down! Don’t even get me started on how much I miss real cheese! I liked the soup. It was not a true clam chowder but it was still good and very flavorful. I think sometimes you just have to play pretend when you are cutting out foods from your diet. It was better than a poke in the eye with a sharp stick, regardless. I would like to know what it is about certain people and their ability of inability to garden. I try but nothing grows well for me, but my child can grow anything! I think from now on, I am putting him in charge of the garden. Tags: cooking, Crock pot, Dairy free, DIY, organic gardening with children | Permalink.